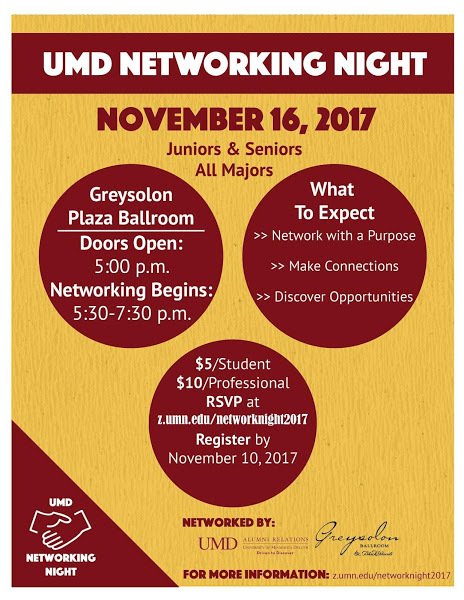 UMD Alumni Relations is inviting juniors and seniors to its annual Networking Night next Thursday, Nov. 16. From 5:30 p.m. to 7:30 p.m. in the Greysolon Plaza Ballroom, students can visit a number of local businesses from the surrounding area and meet new people for potential job or business opportunities. “I just think it’s a really good thing for upperclassmen,” said senior Carla Jackson-Johnson. Jackson-Johnson attended last year’s Networking Night, and is excited to come back again. “Getting out there and learning about new things is something I think juniors and seniors especially should do, so I’m looking forward to it,” she said. According to the UMD events page, local businesses that will be attending include NORTHFORCE and Trillium Services, as well as Lindly Success Strategies and Northwestern Mutual. Senior Rob Kaasa has been to two previous Networking Nights at UMD and has been to several related functions around the Duluth area. He said that it’s important students realize that the event has a relaxed environment. Tickets for the event are $5 for students, and Alumni Relations stressed that everyone willing to attend should RSVP by Monday, Nov. 13.